The Curious Capitalist: Jobs! Jobs! Jobs! For all the relief over the jobless figures released by the Bureau of Labor Statistics Friday morning  247,000 jobs were lost in July, far fewer than economists had expected  a dark problem lurks in the numbers: dangerously high levels of long-term unemployment in America. Unlike recent recessions, the current economic crisis has been characterized by skyrocketing numbers of those out of work for three, six or more months at a time. Economists worry that the shock of the past year's financial crisis may have driven the U.S. into a period of permanently high unemployment similar to what Europe has suffered for decades. While overall unemployment dropped from 9.5% in June to 9.4% in July, the number of long-term unemployed (those jobless for 27 weeks or more) increased to 4.9 million, up from 4.4 million in June. Viewed another way, 32.5% of the total unemployed had been looking for work for longer than half a year, up from 28.9% in June. "This recession is taking people a very long time relative to past recessions to find another job," says John Irons, policy director at the Economic Policy Institute in Washington. Traditionally the U.S. has been able to maintain unemployment at 5% or less, while Europe has for the past few decades been stuck at 8%, even during periods of economic growth. There are several reasons to worry about the high long-term unemployment numbers. On the individual level, the longer you stay unemployed, the more unemployable you become. People lose job skills, social skills and the will to search for a job as they spend time out of work. Unemployment affects individuals' sense of well being, producing higher rates of depression and lower levels of life satisfaction. Studies have shown mixed results as to the effect of unemployment on health. On average all job losers tend to face a permanent reduction in their salary, and that is even more common for the long-term unemployed. Long-term unemployment is also dangerous for the economy as a whole. One quarter of the long-term unemployed permanently leave the workforce, a recent study by the Congressional Budget Office found, producing increased loss of output in the economy. Long-term unemployment burdens social services, diminishes spending levels in the economy and drains overall savings. 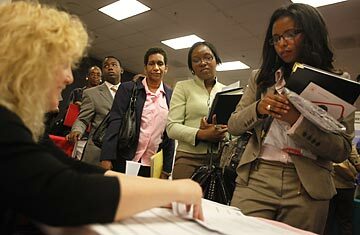 It can also affect unemployment among young, first-time job-seekers. "Long-term unemployment is debilitating for people trying to find jobs in the first place," says Professor James K. Galbraith of the University of Texas at Austin. The more long term unemployed there are already competing for jobs with long résumés, the harder it is for first timers with no work experience to get the job, thereby tossing them into the pool and sustaining the high rate. Democrats in Washington have taken extraordinary steps to address long-term unemployment in this recession. Last year Congress added 33 extra weeks of unemployment benefits. As part of the stimulus bill this year, Congress added an additional potential 20 weeks for the worst hit states, raising to 79 weeks the maximum time a laid-off worker can draw unemployment assistance while looking for a job. To combat "hysteresis," or the atrophying of job skills in the labor force, the Labor Department issued an opinion earlier this year that workers can still draw unemployment insurance even if they work a volunteer job during their search for a paying one. To judge from the spiking numbers, those efforts may be having an effect. Despite criticism from the right that the stimulus was a waste and risked adding to government jobs, not private-sector ones, the unexpected drop in overall rates came with only an additional 7,000 jobs in the government sector. But July's indications of improvements do little to ease some economists' fears about long-term unemployment now that 1 in 3 unemployed persons has been looking for work for 27 weeks or more. Galbraith of the University of Texas at Austin believes that some workers have intentionally left the job pool  fed up with rejection  and will begin searching for work again only once the economy improves, keeping the long-term rate high. "Even if things stabilize and start to improve, bringing the unemployment rate down below 9% is going to be a struggle," Galbraith says.